Added a download for the aia file. See the very bottom of the post. The ABC app is a simple app that I first created to allow me to monitor Arduino pins and to give me basic control functions. It isn’t designed for complex control. I have received many comments and suggestions about the ABC app and as a result I created the new Bluetooth Control Panel app. This features better control functions and was designed around the function rather than the Arduino pin. Arduino Bluetooth Control is a simple to use Android app for controlling and/or monitoring Arduino pins over Bluetooth. The app is self contained and all initialization is done from the Arduino sketch. It is designed around Arduino pins rather than control function. Now updated to version 2. Update to the sketches. I was checking the elapsed time incorrectly. Took me longer than it should have to spot it. The app now sends a <RESET> code when the RESET button is clicked. This allows the Arduino to detect the app reset and automatically resend the initiation commands. See below for an example sketch. Only the pins you are using (have initialized) are displayed. – Digital pins range from D2 to D12. – Digital pins can be input or output. – The value can be set to HIGH or LOW. – The pin state can be controlled by the Arduino and the value displayed by the Android app. – The pin state can be controlled by the Android app. – PWN pins are output only. 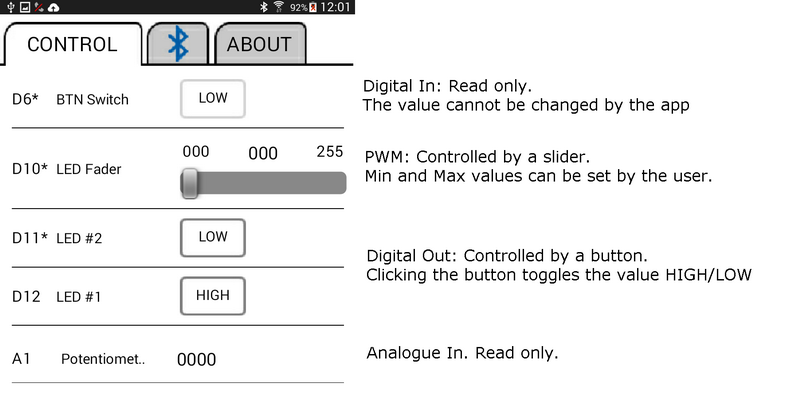 – The PWM Pin value is controlled by a slider in the Android app. – The minimum and maximum values can be set for each pin. – The smallest minimum is 0. – The largest maximum is 255. – The analogue pins are A0 to A5. – Analogue pins are input only. – The value, from 0 to 1023, is displayed in the Android app. The Arduino sends initialization commands to the Android app and this means how the app displays a pin depends on the initialization command sent from the Arduino. <P10000255041> – Initialize pin D10 for PWN. Min value is 0. Max value is 255. Start value is 41. <A010102> – Initialize pin A1 for analogue in. Start value is 102. The initialization command for a digital pin is 5 characters (not including the start and end markers). The 2nd and 3rd characters are the pin number. The pin number always uses 2 digits. The 4th character defines if the pin is input or output. I for input. O for output. The final character is the start value. This is the value displayed in the Android app when it first starts, not the actual value of the pin. H for high. L for LOW. The initialization commands for PWM pins are 12 characters long not including the start and end markers. The 4th, 5th and 6th characters are the minimum value for the slider. 000 to 255. The 7th, 8th and 9th characters are the maximum value for the slider. 000 to 255. The 10th, 11th and 12th characters are the starting value of the slider. 000 to 255. The initialization command for analogue pins are 7 characters long not including the start and end markers. The 1st character is the pin type. A for Analogue. The 3rd, 4th, 5th and 6th characters are the starting value displayed in the Android app. 1023 – the starting value to be displayed by the Android app. These can be changed using the “Name” command. All pins have a default description which is applied when the pin is initialized. If you initialize a pin after changing its name, the given name will be over written by the default name. The final command is the “Number of commands” command. This is used by the Android app to check whether or not it has received all the initialization commands correctly. The command is C followed by the number of commands. 7 – the number of commands not including itself. The count command is used to check that all commands have been received by the app. If the app does not receive the number of commands specified by the count command then an error message will be displayed. The number is the number of commands not including the “Number of commands” command. If an incorrect command is received by the Android app an error message will be displayed and the command will be ignored. If the app does not display a pin check the initialization commands for errors. If you reset the Arduino while the Android app is running you will also need to reset the app. The app will continue to run but the pin values will not be updated. Either restart the app or click the reset button on the Bluetooth page. 1. Those sent from the Arduino to the Android app. 2. Those sent from the app to the Arduino. Sending data from the Arduino to the Android app. Pin data commands sent from the Arduino use [ and ] as start and end markers. Digital pins can be either HIGH or LOW. The command is shortened to H or L.
For digital pins the command is basically the pin number and the status. Analogue pins can have a value from 0 to 1023. The value should be converted to a string before sending to the app. For analogue pins the command is the pin number plus the value sent as a string. Note that the value is always 4 digits. There are 2 types of data command that can be received from the Android app. When a digital pin button is clicked in the Android app either a HIGH command or a LOW command is sent to the Arduino. The pin data command consists of the pin number plus the value, H for HIGH. L for LOW. It is up to the sketch to interpret the commands and act accordingly. IE actually set the pin HIGH or LOW using digitalWrite(). The received command is stored in the receivedChars global variable and you will need to check this to see what the pin number is and what the value is. Note that the start and end markers are stripped away so receivedChars contains only the actual command. The value is always 3 digits. This example uses a single LED on Pin 12. The LEd is controlled via the Android app. The bluetooth module is a HC-06 set for 9600 baud rate. You can use different baud rates if you wish. Match the baud rate in the sketch with the baud rate of your Bluetooth device. A HC-05 can be used as well. There are 2 parts to setting up the pins in the sketch. This is the regular Arduino pin set up. Send the commands to the Android app. The commands tell the app which pins are input and which pins are output. Pin 12 is set to digital out with an initial value of LOW. C1 is the number of commands (not including iteself in the count) and is used as a check by the app to see if all commands were received correctly. The Android app counts the number of initialization commands it receives and if this total does not match the total number of commands initialization commands (C1) an error message is displayed. The number of commands does not include the <START> and <END> markers. On start up, the sketch keeps sending the initialization commands until it receives an “OK” reply from the Android app. Once a reply is received the app starts sending and receiving pin value data. It is worth noting that the sketch doesn’t know if Bluetooth is connected or not. 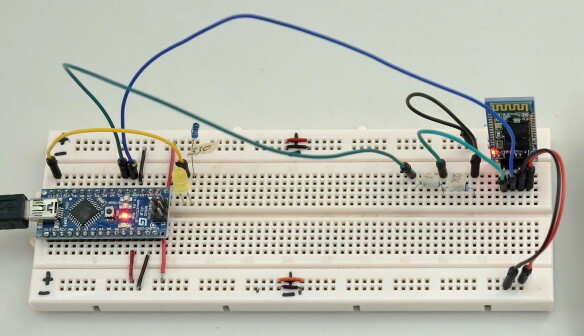 processCommand() – this checks the received data and if the pin number matches the pin we are using (D12) it is set HIGH or LOW to turn the LED either on or off. * Requires the Arduino Bluetooth Control Android App. Can be downloaded from Google Play. // keep sending the initialization commands until ew receive an "OK"
// send the initialization commands once every second. This can be changed to suit your own sketch. // After the Android app receives the commands it sends an "OK" back. // does the pin data command start with a "D"
This example uses a servo on Pin D5. This example has a single servo connected to pin D5. The servo is controlled by using a slider in the Android app. 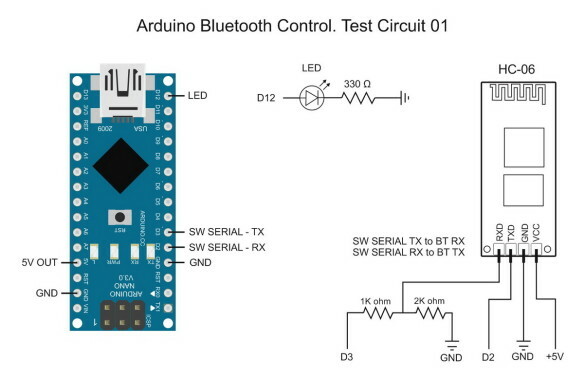 The SoftwareSerial and Servo libraries use the same Arduino resources and do not play nice together, therefore, I am using hardware serial to talk to the Bluetooth module. I am using a 5V breadboard power supply to power the servo and the Bluetooth module. The Arduino is powered from the USB, however, once programmed, the Arduino could take power from the breadboard power supply as well. All grounds are connected. Initialize pin D5 as PWN. Min=0, max=170. Set the pin description to “ServoPos”. Serial.print("<C2>");                   // number of commands not including itself. Since I am only controlling a servo all we need to do it check to see if we have new commands and if we do move the servo. recvWithStartEndMarkers() – this checks serial in and takes any data that is between the start and end markers (< and >) and places it in to the global variable receivedChars. Any data not within the markers is ignored. processCommand() – this checks receivedChars and if it is a PWM command we move the servo accordingly. The PWN command has a 3 digit value in ascii format, for example “123”, and this is converted to a numeric value. Because this example uses the hardware serial we cannot upload the sketch while the Arduino is connected to the RX and TX pins. Remove the connections, upload the sketch, and then redo the connections. * Requires the Arduino Bluetooth Control Android App. * It is recommended not to power the servo from the Arduino. // Send initialization commands and the wait for an "OK"
// This bit flashes the LED on pin 13. // Keep sending the initialization commands until the "OK" reply is received. // The Android app receives the commands and sends an "OK" back. It also uses the built in LED on pin D13. All pins are given a descriptive name using the Name command. The LEDs are controlled from the app; 2 are on/off and 1 is fade on / fade off. The state of the push button and the value of the potentiometer are shown in the app. The button switch can be either HIGH or LOW. The potentiometer value can be from 0 to 1023. The LED on pin 13 is used to show the sketch status; blinking means sending initialization commands and waiting for the app to reply. Solid on means initialised and receiving/transmitting pin status data. Pin D10, D11, and D12 have LEDs. The LEDs on pin D11 and D12 are on/off only. The LED on pin D10 is controlled via a PWM signal and fade in and out. Pin D6 has a button switch attached. The status of the pin is checked and, if the value has changed, the value is sent to the Android app. Pin A1 has a potentiometer attached, the pin is checked using analogRead() and the value sent to the Android app. Set the pins; the LED pins for output and D6 for input. // Set the LED pins to output and turn them off. BTserial.print("<C10>");                   // number of commands not including itself. checkPins() – this reads the input pins status and if changed sends the value out via software serial. // I only send a value if the value has changed. BTserial.print("<C10>");                  // number of commands not including itself. //The pot I am using jitters +/- 1 so I only using changes of 2 or more. // Check the state of pin 6 - the button switch. All this sketch does is read analogue pin A1 and send the value to the Android app. We are not receiving any data from the app and so we do not need to check. BTserial.print("<C2>");                   // number of commands not including itself. In version 3 of the app I added a <RESET> command. Here is a brief example on how to use it to have the Arduino automatically resend the initiazation commands when it detects the reset. The main difference in the sketch is that the part that sends the initization commands has been moved to its own function. The means we can call it at anytime. The varaible initialized is used to show whether or not we have sent the init commands and received a reply. 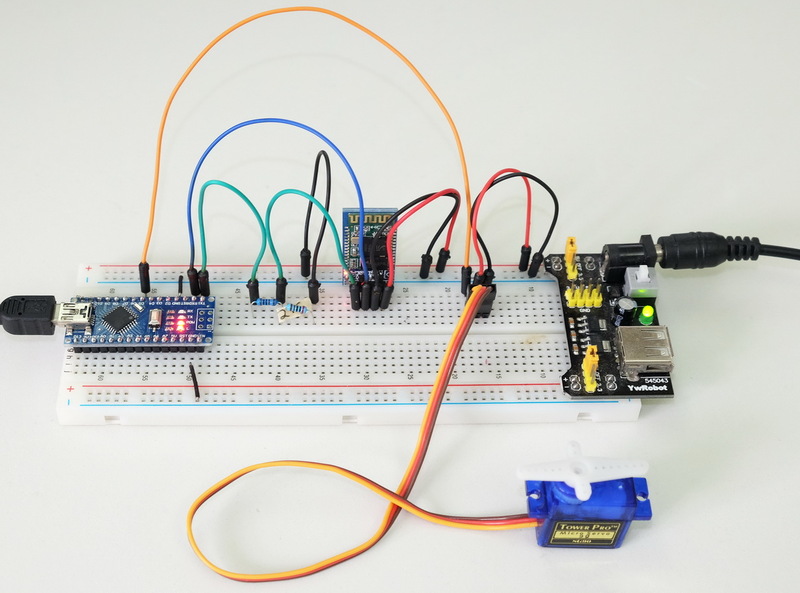 When initialized is TRUE we know the Arduino has connected to the app and we can start to send and/or receive pin data. We we receive the <RESET> command we simply set initialized to FALSE. // I only send a value if the value of the sensor has changed. // This means I need to store the old value so I can compare. sendInitCommands();  // send the init commands and wait for a reply. * Sends initialization commands and then waits for a "OK" reply. A lot of people have asked for the aia file and I had always intended to release the code but wanted to clean it up before posting. Unfortunately I never got round to doing so and the longer I left the harder it was to get back to. I also feel the graphics could be a lot better. The code works fine but it is not particularly efficient. There are 2 very similar code blocks handling the initiation commands and the data commands. These could very easily be merged in to one. If you use the code to make something more interesting, please let me know. First of all: thanks for sharing! Nice. When I was working on an app created with MIT App Inventor 2 I came across your post. I have created a moodlight with an APA102 LED string with configurable settings in EEPROM on the Arduino. What I wanted to do is let the app send a command to retrieve the settings, the Arduino will then return key=value pairs, the same pairs that can be sent by the app. So if the Arduino needs to refresh the settings on the app it can send the values. So, would it be an added feature to let the Arduino set the values on the app? This is very possible but beyond the scope of the above. My solution would be to implement the processCommand() and recvWithStartEndMarkers() functions in the Android app, use start and end markers, and then process commands in app the same way as in the Arduino sketch. I am from the MIT2 forum. I changed the 003 sample. As said I declared ValueOut1 as integer. it is only one value in the last line and there is no update but that is correct. As the value is not changing as it is a static one the serial monitor does not show them line by line. But the ABC app does show 0000 in the datafield and not 1023. Your help is appricaited to get things going. It looks like the Bluetooth module is disconnecting. See “receivedChars = DISCONECT”. What BT module are you using? 0000 is the default value. You can change this to something else in the initialization command, try <A011111>. I will try to add a sketch later this weekend showing the bare minimum required for an analogue sensor. Just added example 04. A basic example for monitoring a single analogue pin. I have noticed that sometimes the Arduino is not quite ready when the app sends the acknowledgement signal and the signal gets corrupted and not recognised. When this happens the sketch will keep sending the init codes but the app has already displayed the pin but the pin value will not change. If this happens try using the RESET button on the Bluetooth tab. 06.12.2015: figured this out. I was checking the elapsed time incorrectly. I was using “if ( millis()-refreshRate > startTime)” instead of “if ( millis()-startTime > refreshRate)”. I have updated the above sketches. When I change the value to 1023 it is nicely mentioned in the ABC app. I just blew my Nano so have to wait for new supply to test more then one serial data value. Let you know. Finally I found this great app for controlling arduino :) I think this is the best app. Thank you Martyn you are very talented. I am working on a project and I need some help to write the code and using the Bluetooth module for controlling. – program start switch: which starts a program of running the motor for example 10 sec. and after 10 sec. stops. Can I do this with bluetooth and your ABC app? You can do this by re-purposing the commands and ignoring the pin numbers but it would not be an ideal solution. On the Arduino side you can perform any function you like based on the commands received. For example D02H does not have to mean bring pin D2 HIGH. It could mean start a motor on pin 10. It is up to you. D4 – set program. HIGH = start program (start the motor for 10 seconds). When the program has completed send a commands from the Arduino to change the status to LOW. D5 – slider to control the motor speed. Another example. I use a slider (min=1 max=4) to determine 1 of 4 actions rather than 4 separate buttons. I am now travelling until after the new year so cannot offer more help and all I can suggest is experiment. Can you help me please writing the code for the above application? How can I start and, how to send the commands to the H298N bridge for controling the dc motor? assuming you have 2 directions; left and right, I would use a slider. Min value 1, max value 3. Initial value 2. Then in the Arduino sketch a 1 would mean left, 3 would mean right and 2 would mean off/stop. This would work for a simply on/off system but would not offer any speed control. If you wanted speed control you could use a slider with a larger scale, for example 0-100 and then use 0-49 for left, 51-100 for right and 50 as off. 1 would be fastest left and 100 would be fastest right. Using buttons is not the best solution because you can have both buttons HIGH at the same time and of course you cannot have a motor turning left and right at the same time. ABC is not really the best solution for your project. 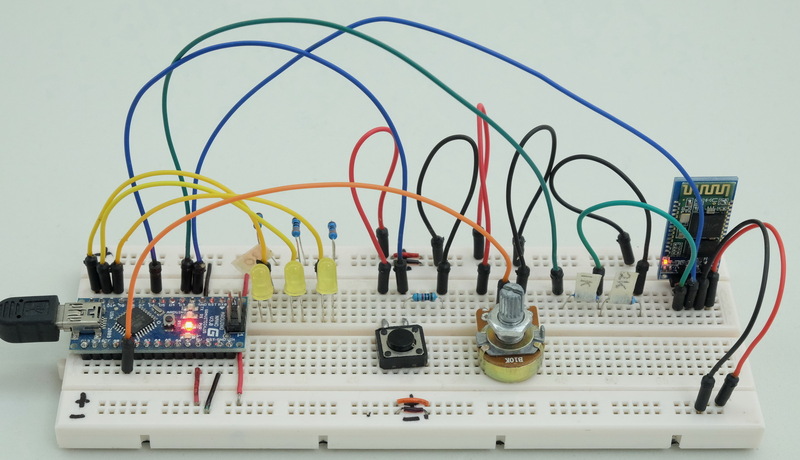 It was designed as a simply way to control or monitor Arduino pins. I am now working on a different controller which is based on functions rather than pins but it is likely to be a while before it is ready. Your project has inspired me to add motor control and toggle buttons. Something I had not considered before. If you fancy having a play with app inventor have a look at http://www.martyncurrey.com/arduinobtcontrol/ which includes a navigation keypad that may be better suited for your project. The aia file is available for download. Now I have a working controller :), finally I’ve figured out. So I have a button for Left turn and for Right turn. If both are LOW the motor is stopped. If I change HIGH or the left or the right button the motor tuns left or right. And I have a slider for speed control. One more question. How can I assign a slider to control LOW HIGH parameters and not PWM? Can you help me with a sample code. And what do you think what is wrong with the code? when I press the reset in the app, doesn’t make the reinitialization. the app says waiting for initialization commands. I need to press the reset button on arduino to initialize. it is up to you how you handle the data the Arduino receives from the app. 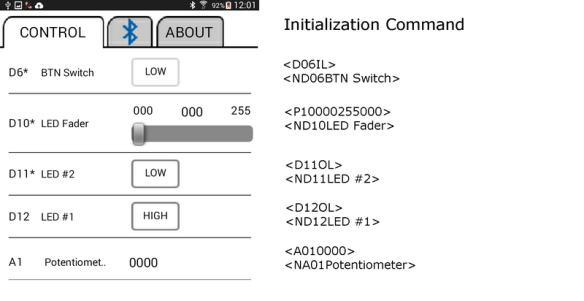 For example the slider data <P10000> and <P10001> can be used as a switch. If the value = 000 set a pin to LOW, if it is 001 set a pin HIGH. Or even display a message on an LCD, or flash an LED. The reset button restarts the app and so the initialization commands need to be resent. Is it possible after pressing the reset button in the app, the initialization codes to be resent automatically? The reset button was implemented so that when the Arduino is restarted you do not need to restart the app, just use the reset button. First of all your project is nice ! Can you please add the .aia file for app inventor here, so that we can see how the app work ? Is it possible to digital read data from a sensor. I have a dht 21 temp and humidity sensor and I can’t figured out how to see data on phone. Data is transmited on a single digital pin, out pin(D20 for example). I will apreciate very much if you can help me. I would suggest breaking the problem down in to small tasks. Get the sensors working first with output to the serial monitor. Once you are happy with this then add the app. Use test sketch 4 as a starting point. can you give me an arduino code for dimming a led. i need it for my project. Have a look at Example 3 above. One of the LEDs in the example is controlled by a slider. can you give me sample slider blocks in app inventor? First of all thank you very very much for sharing this awesome knowledge with us. It helped me to get most of my answers. Well i am unable to write a code for my arduino to control my 8-channel relay board without any errors. kindly help me with this,i am using your app. To get started simply extend Example 01. To add extra pins there are 3 things to extend; 2 inside the setup() function and 1 inside the processCommand() function. Does the ABC work with a BlueSMiRF RN-41 module & Arduino Mega? If not, is their a way to adapt it to? The BlueSMiRF RN-41 device is Bluetooth V2.0 and although I haven’t tried (I don’t own one) it should work. Please let me know how you get on. thank you for sharing! very interesting. With another android app (blueterm) i can connect without any problems. i would appreciate any hint to get things going. I assume the nexus and the hc-05 are paired. Does the hc-05 appear in the paired devices list when you click the connect button in the ABC app? thank´s for your reply. of course both the nexus and hc-05 are paired, and as i mentioned other apps like blueterm connect without any problems. After pressing the CONNECT button you should see a list of paired devices. See the example #1 video at about 34 seconds. do you get any error message when you select the HC-05 or does it say connected? If it connects and then nothing happens you may have an issue with the initialization commands. finally i solved the problem by unrooting (took me a while) my Smartphone. Every thing works now just fine. Thank you for your help and good luck. is it possible to have the .AIA of this awesome app. Hi Martyn! You are awesome. I spent like 3 days trying to make my bluetooth work, and after i have found your site, i did it in 15 mins. You are just awesome. Now i have a question. I want to turn on/off a water pump with relay module. The waterpump is simple, you plug it in and it goes on. Could you help me a bit with the code on arduino how it should look. I use your sample ( 3 one). Thanks a lot for everything you did. Sorry for english, its not my native language. Have a nice day! Segment: Start(5) + length(1) -1 exceeds text length(4). yes, this is an error when parsing commands or data. When you get this error, what data are you sending to the app? i want to use 7 pins. Then i upload on arduino. I log in the apps. And after i connect to arduino with the phone, after 1 second the error pops up. It is going to be a few days before I can look at this. In the meantime try removing the BTserial.print(“”); statements. These are not required and I think are causing the problem. But if i remove these statements, the commands(buttons) wont show in the app. ic, they are actually the init commands. WordPress though they were tags and removed them…. can you repost the commands replacing the < and > characters with [ and ] so they show up. Also, do you have the latest version? Compliments of the good work ,very great I must say. Look at the section for init commands and the data commands above. Having the same problem as bluez ,I’m trying to have multiple sensors ,like on the example 3 ,I want 3 analoge sensors and 3 digital sensors . the example works well but when I make extras on the code its none responsive. can you please just write an example of 2 or more digital inputs and two or more analogue inputs on one progam please..
I’ll try to add an extended example. In the meantime, do not flood the app with data. If you do not need instant updates limit how often you send data, for example once a second or once every 100ms. You would need to change how you initialise the pins. Read the pin status first and then create the appropriate initialisation command. So i would have to put that example on the initializing commands ? Hi. I tried your app on my Galaxy Note 4 and no matter which version of arduino code I use I cannot get it to initialise. Using the monitor I can see it is sending the initialisation request and it does receive commands from the Galaxy (RESET and DISCONNECT). Any ideas? Confirm you have a working connection. Set up a connection using a terminal app on the Samsung. Hi. It seems the module isnt in AT mode. using the linked code i can send “text” to the arduino via the bletooth and its echoed in the serial monitor but it doesnt respond to AT commands. sending from the arduino to the galaxy shows nothing. The app requires the Bluetooth module to be in communication mode. It doesn’t use AT mode. You do need to match the modules communication baud rate with the BTserial.begin(9600); statement in the sketch though. I use 9600 in all the examples as this is the normal default speed for most BT modules, however, yours maybe be different and you will need AT mode to check. Determine which Bluetooth modules you have and then Google the model number. If they are one of the common models I may have a guide on the site. Some start in AT mode, other need to be put in to AT mode. Can you see the BT modules when using an Android device? What name do they show? Most likely you have a problem with the connection between Arduino TX and BT module RX. Check the connections and double check you are using the correct value resistors. Hi, That was my first thought and I did check. I think I will start again and use a logic level converter I have lying around somewhere, I have used these before on the HC-O5 module with success. Thanks for the advise. Check that the code for the servo on pin 6 is actually addressing pin 6. Hey Martyn, just wanted to thank you for making this app and your prompt response. I used your app to control a pentathlete robot with 2 stepper motors and a servo and it worked out great for a mock ASME competition! (although we didn’t spec out the right motors and the h-bridges couldn’t handle the power output) The tutorials and examples were useful and simple enough for an ME who’s never used an arduino before! thanks again! i could send you the blocks of aia app. but i there isn’t filed for attach file here do you have facebook?? I am using Arduino pro mini with HC-05 via level convertor. I am able to pair & connect the HC-05 with the mobile, rate of LED flashing in HC-05 is reduced. Kindly advise where my mistake might be & help me to cross this hurdle. Sorry, for some reasons, all characters within “greater than” & “smaller than” are all ignored in my reply. I hope the following get across. No, they are not getting across…..anyway, what I’m saying is: the arduino sends out the correct initialization code but the app thinks its not. show that you have used [ and ] for the init commands use < and >. Please allow me to explain my problem again. The example004b sketch, for 1 pot, is copied from this website and uploaded to my pro mini without any change. What do you get in the serial monitor? Do the other examples work? 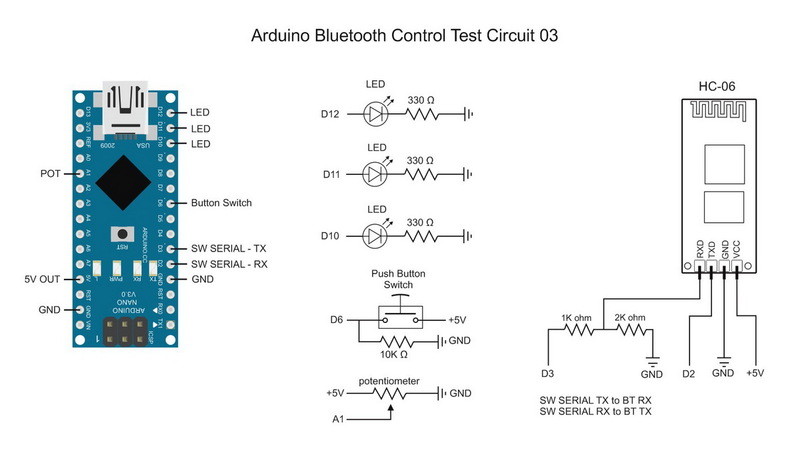 I have uploaded ArduinoSketch_ArduinoBluetoothControl_example001_single_LED_b, without any change. Serial monitor reports receivedChars=RESET when RESET is pressed, same for CONNECT & DISCONNECT. Most time its displaying Initialization commands sent. Waitng for reply. No improvement using another mobile. Little bit stumped. I tried the examples again and all worked fine. At the weekend I will try to review the app source code see if I can spot anything. Do you have the latest version of the app? 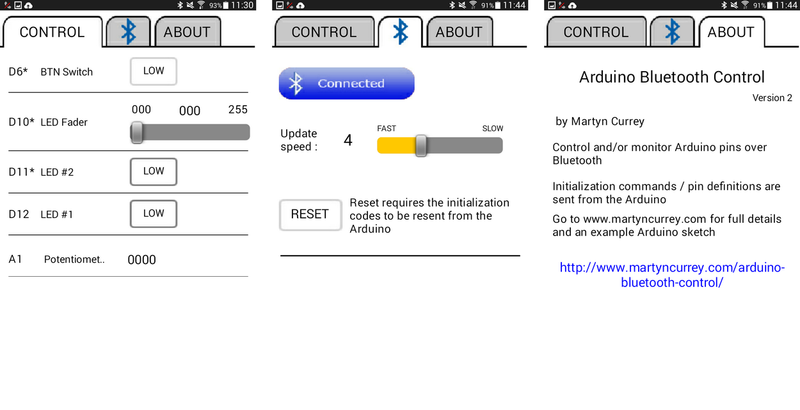 The “ABOUT” tab of your app says Bluetooth Control Panel version 3. Meanwhile, I have watch the youtube #36 Control your Arduino from your phone – HC06 Bluetooth mo.mp4 by Mr.Ralph S Bacon, downloaded his app & the arduino sketch. In that arduino sketch, I have changed the pin alloted to the led, as per your example001, and added A1as analog input for the potentiometer. I read the pot, convert result to ascii & sent it thro’ the softwareserial. I am able to turn the led on & off via the bluetooth terminal, and the analog input is also received by the terminal, although preceded by 2 <error>. I have yet to find out why 2 errors were returned. My hurdle seems to be similar to the problem described by David(31august2016) above. 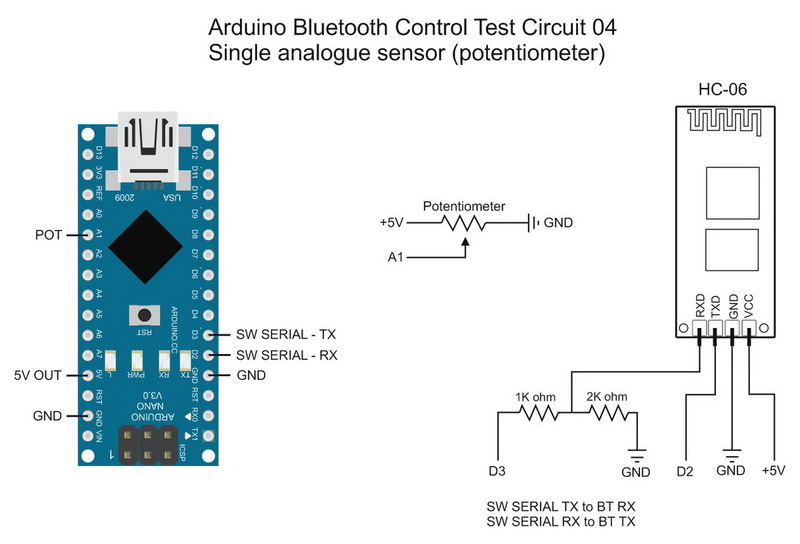 You have posted comments in the Arduino Bluetooth Control post. The two are different apps and use different commands. Please take a look at the other post. One last word here before I move on to post in the Bluetooth Control Panel tab. 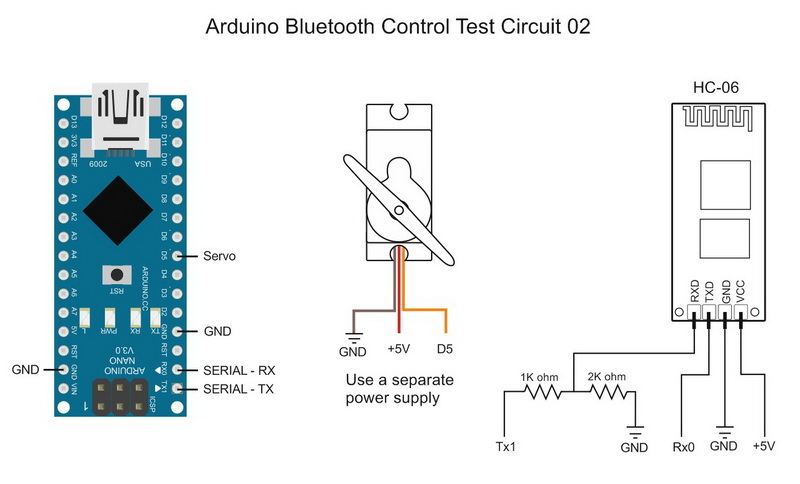 I was unaware that the sketches found in the Arduino Bluetooth Control tab are incompatible with the Bluetooth Control Panel Version3, installed from the play store. After your advise, I have successfully used BCP_Example_01a_Single_LED.ino with Bluetooth Control Panel version3. Now I’ll have to familiarize on how to control the app via my arduino pro mini. Thank you again. Try using the download sketch rather than copy/paste. If this doesn’t work, what do the error messages say? is there a way you can relese ABC aia file now when you already move to BTC? 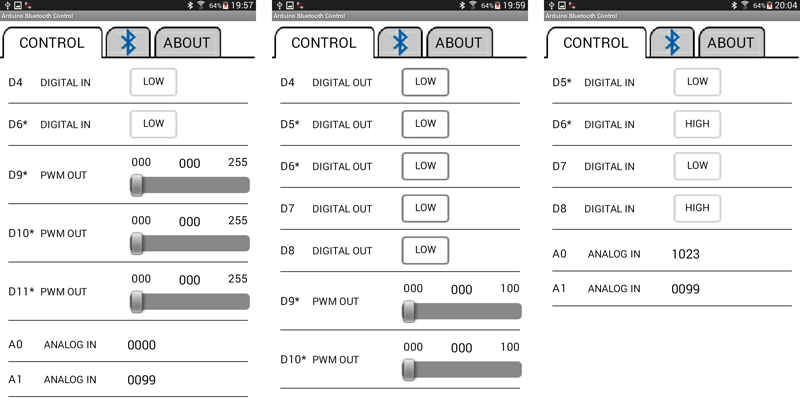 I believe this will be very useful for all users of your beautifull and most valuable app I ever seen about bluetooth communication betwen android and arduino. added a download link at the bottom of the post. You hint at the ability to send a list in the .WriteString procedure. When I have tried it, I find that my full list is available in the .StringsWritten callback, but my embedded device only receives the first list item (“test1″,”test2″,”test3″ and only “test1″ shows up at my embedded serial port). Are you using a delimiter when receiving the data?